Staff publicise the cervical screening campaign. Time-pressed nurses and other female staff at an NHS trust are being offered smear tests during their breaks as part of a cervical screening initiative. 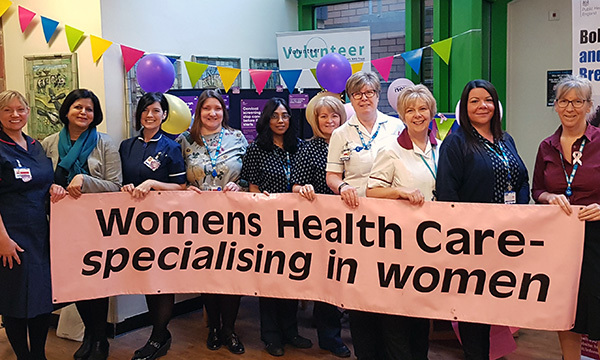 The nurse-led clinics are being held at Bolton NHS Foundation Trust during March and April in support of Public Health England's Cervical Screening Saving Lives campaign. Appointments started filling up as soon as they were promoted, according to a trust spokesperson, and the trust is now considering making the clinics an annual event. Nurse Tina Gundlach-Clare, who manages the women’s health unit said: ‘It’s important we take care of ourselves and each other, so as a team we organised a series of clinics to support our staff. ‘We know our staff are passionate about caring for their patients and sometimes put caring for themselves at the bottom of their list. RELATED: Does anyone care about nurses' health and well-being? The Cervical Screening Saves Lives campaign, which began earlier this month, encourages all women to respond to their cervical screening invitations, and if they missed previous invites, to book a GP appointment. Public Health England research suggest 90% of eligible women (those aged 25 to 64) are likely to have a smear test, yet cervical screening uptake in the UK is at a 20-year low, with one in four women not attending an appointment.